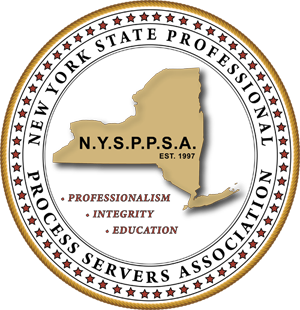 State Association Membership and our Friend Bobby G.
An article summarizing the benefits of membership and celebrating the life of past NYSPPSA president Bob Gulinello. In this year's wrap up, we take a look at the top news stories in process serving and present predictions for the coming year from association and industry leaders. Michael Kern of Kern Legal Services has released a condensed version of his PACES 2014 presentation on Growing Your Process Serving Business. Kern will also be a speaker at ServeCon in March of 2015. Sign up now for Early-Bird Pricing! Effective December 31st, process servers in Florida will no longer be able to serve process in Orange County as the local sheriff has decided to dissolve the program. Amy Miller, Public Policy Director for the Colorado Coalition Against Domestic Violence, discusses victimization and how it relates to process serving. Listen to the full presentation. From an association that has battled many tough legislation challenges, the Mid Atlantic Association of Professional Process Servers has released a statement regarding recent Maryland Process Server Legislation.